THE HEAD OF the Organisation for Economic Cooperation and Development’s (OECD) tax policy unit has said that Ireland is not a tax haven and that the country’s low corporation tax rate is not a problem. Pascal Saint Amans, the director of the OCED’s centre for tax policy and administration, told an Oireachtas Committee today that Ireland does not meet any of the organisation’s critera to be defined as a tax haven – that there is no taxes, no transparency and no exchange of information. “Clearly Ireland does not fall at all in this category,” he told the Oireachtas Finance sub-committee saying that “Ireland is not a tax haven”. He said that the country was at the forefront of fighting tax evasion and said Ireland was “very far from the definition of the tax haven”. 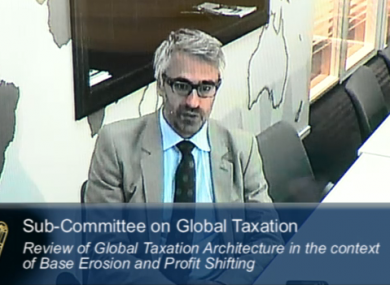 The committee is examining global taxation structures in light of the OECD’s Base Erosion and Profit Shifting (BEPS) project. BEPS aims to close tax loopholes that allow multinational companies to avoid paying their fair share of tax. A recent action plan has set out 15 actions to tackle evasion including preventing abuse of tax structures in different jurisdictions and greater sharing of information among countries. Ireland was at the centre of controversy earlier this year when US Senate committee claimed the country operated as a tax haven for multinationals like Apple. The government has continuously denied this as well as claims that Apple negotiated an effective two per cent tax rate with the Irish government. Saint Amans said that Ireland’s corporation tax rate of 12.5 per cent – a bone of contention for some European countries is “not a problem in the international environment as is”. He said that the issue of multinationals not paying enough tax was a result of discrepancies in tax systems. “The gaps between tax sovereignties have resulted in lowering effective tax rates of companies,” he said expressing confidence that recently agreement of the G20 countries to exchange tax information would help to counter this. Saint Amans said that the so-called double Irish arrangement, which allows companies to lower their corporate tax liability, was not a result of Irish legislation alone but “the result of the articulation of different pieces of both domestic legislation and international tax law”. He said Ireland could not address and fix this practice on its own and that it would require international cooperation. Email “OECD tax chief: 'Ireland is not a tax haven'”. Feedback on “OECD tax chief: 'Ireland is not a tax haven'”.